I’ve always been fascinated by cats. In fact my first suitor, a sweet seven year old named Lance, presented me a National Geographic featuring a cat article. It worked! I was inspired to start Corvallis Cat Care after many experiences working in other veterinary clinics where I became the doctor always scheduled to see the cats, especially those thought to be irascible. I came to appreciate that they were not “bad”, they were just scared. After experiencing how uncomfortable my own cats were when visiting veterinary clinics, I wanted to create a hospital where I would want to take my own cats, a place that would meet my expectations as a concerned cat guardian. I envisioned a space that, unlike most practices, would have windows in the exam rooms so feline patients could connect to the outside world and be soothed by something familiar while being in a very unfamiliar place. I wanted to build a hospital staffed by members who all really liked cats and wanted to work with them; staff who were themselves cat people and would understand and appreciate feline sensibilities and cat opinions. I wanted more wood and less metal, fewer smells to offend cat noses, fewer noises. And I wanted to work with other doctors who themselves had a particular fondness for cats. Read more about Dr. Blouin here. Dr. Tamara Kimmel grew up in the Willamette Valley and in 2006 she graduated from the Oregon State University/Washington State University veterinary program having been honored with the Outstanding Senior Award and American Association of Feline Practitioners Senior Award. After graduation Dr. Kimmel completed a small animal medicine and surgery internship at East Bay Veterinary Specialists in CA. She joined their staff as an emergency clinician and for the next four years offered overnight and weekend critical care for the specialists as well as care for walk-in and emergency patients. Dr. Kimmel’s professional interests include preventative care, internal medicine, critical care and diagnostic ultrasound. She is a current member of the American Association of Feline Practitioners, Oregon Medical Association and American Veterinary Medical Association. In 2013 she is also completed additional training in Veterinary Orthopedic Manipulation. Dr. Kimmel and her young family moved back to Oregon in 2010 because, as she says, “The Willamette Valley will always be my home”. When not working her personal interests include knitting, gardening, hiking camping, as well as just spending time outdoors with her daughter and husband. Sheri is a Certified Veterinary Technician and has worked at Corvallis Cat Care since 2006, she particularly enjoys assisting in surgery and dentistry. Sheri’s career as a technician began in 1985 after earning a Bachelor’s degree in Zoology and then an Associate’s degree in Veterinary Technology. She enjoys reading, gardening, hiking and mountain climbing, and has summited Mt. St. Helens. She shares her home with her husband, their two young boys, three cats, and one dog. 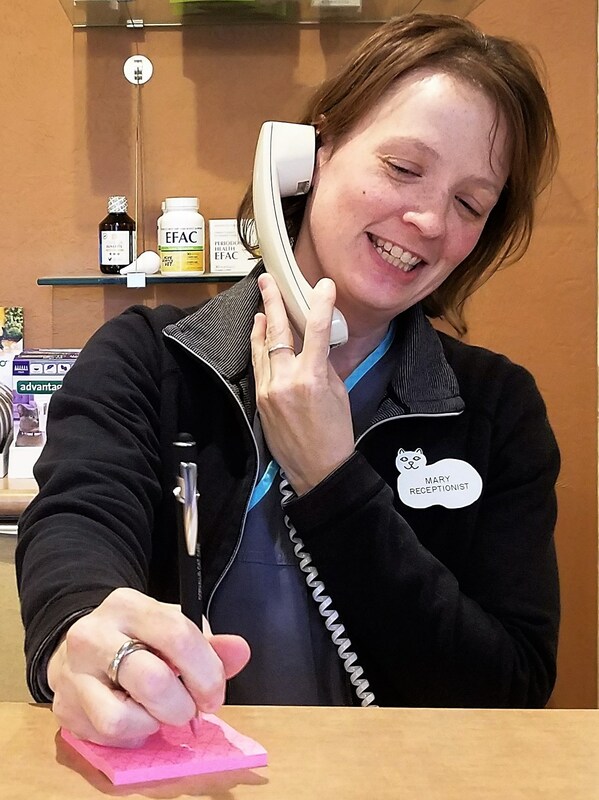 Jannee joined Corvallis Cat Care as a Veterinary Assistant having worked in the veterinary profession over the last 30 years. She has worked with both small and large animals but her true passion is cats. Jannee relocated to Corvallis in order to work with Dr Blouin and is finding that she very much enjoys this area and the opportunity to work exclusively with cats. Ted grew up around many animals at the equestrian stables run by his family in southern Oregon. In 2008 he joined Corvallis Cat Care as a Veterinary Assistant and, in addition to being a calming force for all cats, he continues to lend his eclectic skill set to the business. Much of his spare time is spent absorbing media of all sorts, maintaining a completely inconsistent exercise regime, and wandering listlessly in the wilderness. Judy has been Corvallis Cat Care’s receptionist since 2005. She spent some time in New Mexico where she earned a degree in computer mapping. Then, some years later, she graduated from the four year program at the Barbara Brennan School of Healing as a Certified Practitioner. She currently resides in the country where she spends time with her two cats and her dog. Mary began working as a receptionist with Corvallis Cat Care in June of 2017. She is new to Corvallis but has lived in Oregon most of her life. Mary and her rescue dog Petey like to visit Willamette Park and she also enjoys spending her free time with friends and family. Ricochet has been our resident Clinic Greeter since 2011. Her duties include supervising reception, knee warmer and reassuring our guests. She is partially sighted, so when it is busy she will sometimes retire to the treatment area of the clinic and curl up in her cozy bed.